Everyone has been to a theater, whether it was an auditorium for a sixth grade talent show, a Broadway musical, or even a summer blockbuster on the silver screen. Little do they know, show biz has a lot of tricks up its sleeve for grabbing your attention and keeping it exactly where they want it. In theater, nothing happens by accident. Everything is intricately planned, from where actors stand on stage to what direction the lighting comes from to cast the right shadows, all for the intent of keeping the audience’s attention. This takes months of planning and a whole team of skilled individuals to pull it all off before the curtain rises. Once the audience takes their seat, they are already in position to look ahead at the stage before them and watch the events that will unfold there. Your presentation is very similar. Whether it happens in an auditorium in front of a crowd of hundreds, in a classroom with twenty of your fellow students, or in a conference room with ten board members, everyone there is looking at you and waiting for you to begin. 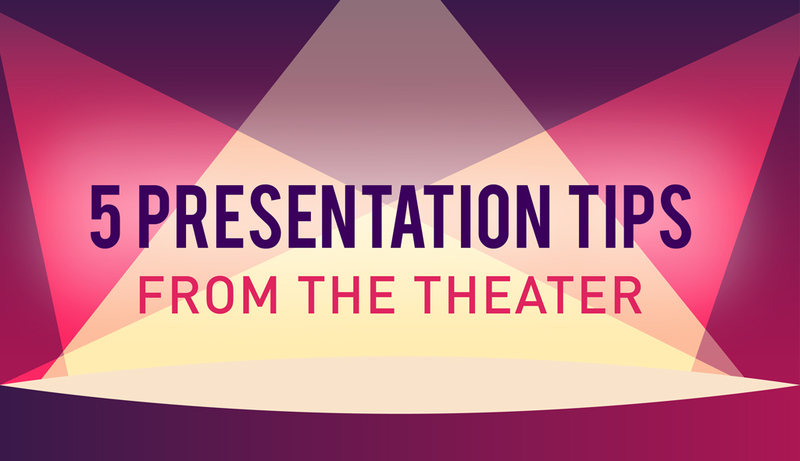 So here are five tips straight from the stage for keeping your audience’s attention and giving your presentation some of that show biz flair. Much like your presentation, stage productions begin their preparation long before opening night. Actors spend hours every day studying their character’s role in the story of the play. Stories are familiar and a common way of transmitting information through visual and audio media. Tales are told on stage as well as the screen like in the evening news by reporters. So why not tell a story with your presentation? This five part format is simple enough to be taught in elementary English classes as a way to easily break stories up into sections. 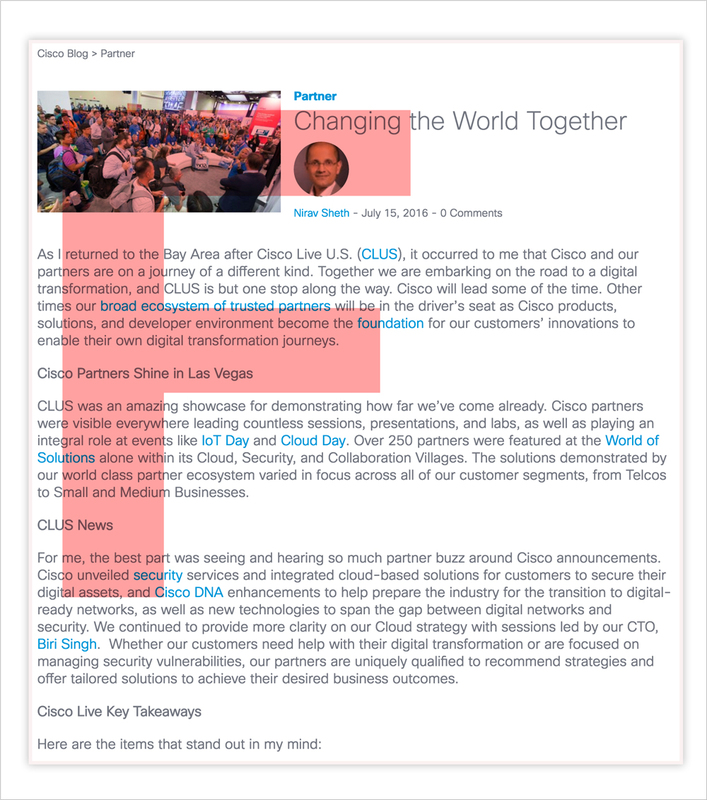 Introduction – Introduce your topic. Background – Supply your audience with the facts and figures of your topic while slowly building to your main purpose for the presentation. 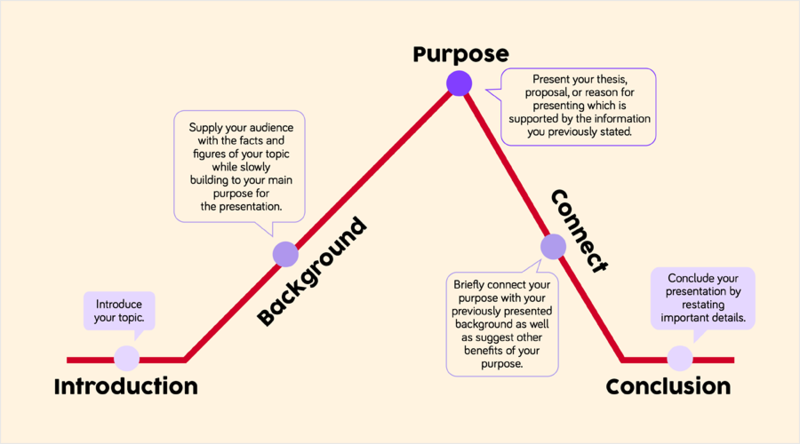 Purpose – Present your thesis, proposal, or reason for presenting which is supported by the information you previously stated. Connect – Briefly connect your purpose with your previously presented background as well as suggest other benefits of your purpose. Conclusion – Conclude your presentation by restating important details. A serious advantage to using a format similar to the mountain is how easy it is to remember. If, during your presentation, you become flustered and forget what to say you will be able to find some comfort in knowing what comes next. 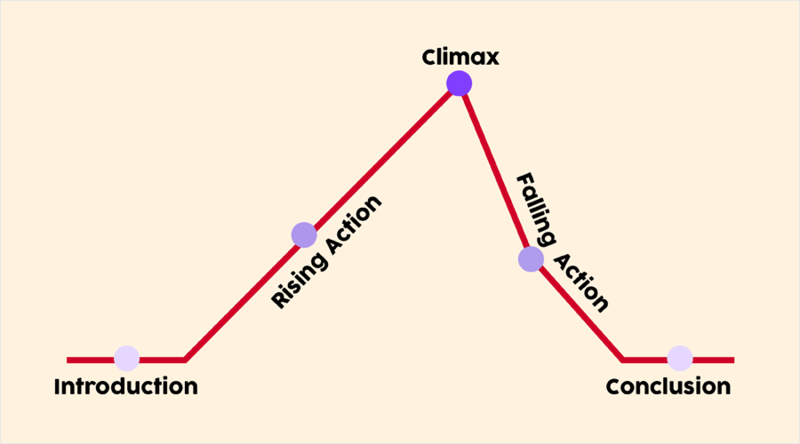 It is a simple story structure and builds to a climax and then concludes. By using this familiar format, you can design your presentation to be easily accessible to your audience and also simple for you to remember. As you design your presentation, it is important to keep from getting too caught up in adding every bell and whistle you find. It is useful to treat your presentation as a black box theater which is a single room with no division between the audience and actors. It is small, simple, and most importantly flexible to any design you have in mind. Anything is possible. This also means you can very easily overdo it. When it comes to designing sets for a play, it is important that they help to illuminate the final product rather than dominate. Great sets tend to appear natural and draw little attention. Your visual aid should do the same, adding relevance and ease to your presentation. 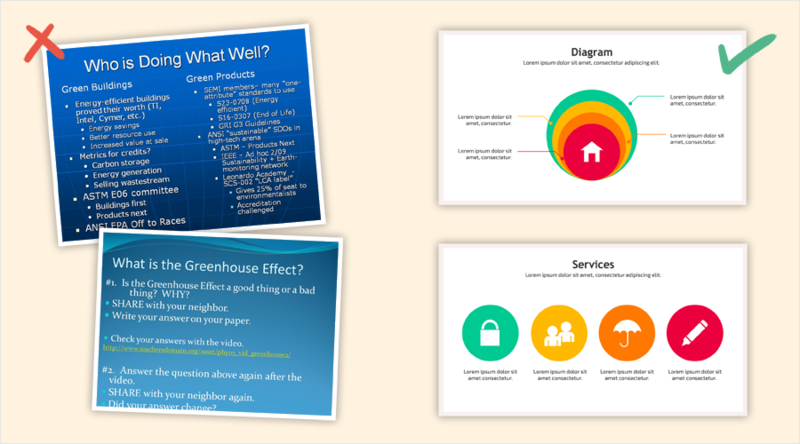 While putting your presentation together, feel free to add effects such as animated texts and slide transitions, but be sure you use them in moderation. Too much can be distracting. A black box theater is small, so every inch of set has to be important in some way. If there is a large piece of set that has to move from one side of the room to the other with every new scene it will prove to be disruptive and slow down the pace of the show. The same is true for animation effects and graphic elements. Too many on a slide can become a distraction from your information. Using simple effects such as fading to your next slide and having bullet points appear one at a time are a great way to gradually introduce your audience to the information you are conveying while still moving quickly and keeping their attention where you want it. If you choose to use longer animations for your text, such as the letters of a sentence bouncing into place one by one, consider using it only on slide titles as an emphasis. Long animations on every line will slow you down and distract your audience. When designing your presentation, be sure to value pace over showiness. Too many extra effects will pull your audience’s attention away from your information to the frills you added. Keep their attention where you want it by keeping it simple. When deciding where certain scenes take place in a show, a lot of consideration is put into whether action occurs on the left or right side of the stage. In the western world, audience members tend to look at the stage from left to right, as if they were reading a page, and their gaze settles on the right comfortably, like the end of a sentence. It means that when a director wants to grab their attention for a key moment of the play, putting the scene on the left side of the stage will force them out of rest and engage them with the action taking place. The psychology of eye movement when searching a screen for information is slightly different. Studies have shown that viewers tend to look at the left side of websites 69% of the time, spending only 30% glancing at the right. This is partly due to viewers scanning for information rather than reading word for word. The Nielsen Norman group conducted an experiment with eye tracking where they discovered most people scan in an F-shaped pattern, reading horizontally and then vertically. The first two paragraphs of information receive the most attention while the following paragraphs only have the first few words glimpsed at. Your visual aid is a combination of you presenting the topic, like an actor portraying a scene on stage, and your audience searching for information on the screen. When planning your slide layout remember to put your most important material in the upper left corner. Following material should start with keywords to entice them to read further. Be careful to not overload your slide with too many words, however. Keep your text to short phrases that briefly sum up what you are presenting and avoid any text that spans the entire length of your slide. Try balancing your text on the left with an image on the right that will emphasize your information further. Studies show that a way to direct your audience’s attention even further is to use pictures with a person whose gaze looks towards your text. Just be careful to avoid pictures where people are staring straight at the camera as these tend to catch a viewer’s gaze and lead to them not looking at much else. Also, by standing on the left you will be able to connect your audience more easily with your information and catch their attention right where you want it. Once your material is fully ready to present, it is important to prepare yourself. Public speaking is the largest fear among people and stage fright affects even the most seasoned actor, but there are ways to overcome it. One method used by every actor before they take to the stage, whether they were nervous or not, is through their pre-show ritual. This ritual includes everything from vocal warm ups, such as tongue twisters and trilling, to stretching and even putting on makeup. Other popular rituals include listening to music and visiting the stage to become familiar with the space. Before every performance, actors arrive early to prepare and you should too. Other ways of combating stage fright include connecting with your audience as if they were your friends and slowing down. Arriving early gives you the opportunity to become more familiar with your audience and making sure you don’t speed through your presentation, you will be able to feel more comfortable in front of them. By creating your own ritual and arriving early, you can get into a relaxed mindset before presenting and be more prepared. In theater, one of the worst things an actor can do is upstage their fellow performers. Usually, this happens when an actor is positioned towards the back of the stage while in a conversation. This forces the other person talking with them to turn, thus putting their back to the audience and in a rather unfortunate position. It is important to be clear with every action you perform. On stage, much like in your presentation, things are often only stated once. When reading an article, it is possible to refer back to an earlier point if the reader is confused, but your audience only has one chance to hear everything you are saying. Actors convey their thoughts and emotions through verbal and nonverbal means. An audience will look to an actor’s facial expression to see their reaction more often than they will wait to hear if they have anything to say. With their back to an audience, an actor suddenly becomes unreadable. By facing your audience at all times and never turning your back to them, not only are you more engaging, all of your words are clear and directed towards your target. Standing sideways or with your back to them will close you off and make you more difficult to understand. Another important part of presenting is making sure you don’t become upstaged by your own audience. This can easily happen by standing in the wrong place. When your audience sits down, they are given a set sightline to both you and your visual aid. This sightline can become blocked by other people sitting in front of them. At times, this is due to the layout of the room and is impossible for you to rearrange but nothing is more frustrating than being unable to clearly see the presenter and their information. A way to combat an audience’s blocked sightline is through moving as you present. By moving as you present, you engage your audience through your motion and also open yourself up to be viewed by more people. This way, if you become upstaged during your presentation, it is minimal and only temporary. In life, show biz, and presentations alike, all good things must come to an end after delivering a performance fit for the theater. Break a leg! 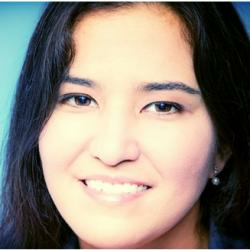 Alexandria Sayers is a content writer for Visme and is currently pursuing a M.A. 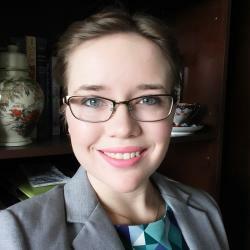 in Art History from George Washington University in Washington D.C. She is passionate about research, writing, and the arts. She has years of experience in theater, both in front of an audience and behind the scenes. I have to credit theater for my ability to speak in front of a crowd without any stage fright. It really helped me fight and calm my fear of public speaking. Thanks for sharing this! Want to set yourself apart from the rest? 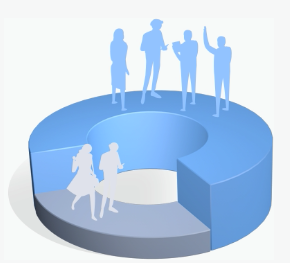 Start creating amazing presentations within minutes with our easy drag-and-drop tool. Access dozens of sleek templates, 100+ free fonts, millions of images and +6,000 icons right now.